Well, I mentioned on Friday that Captain was carving his Saint-O-Lantern. Since then I haven't had any time to post pictures. We have been very busy doing so many fun things, and I am tired!! 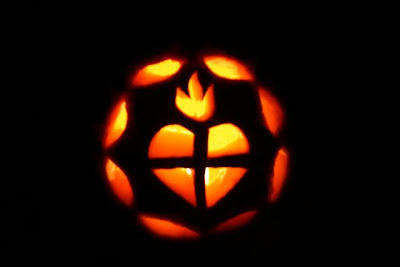 So, real quick, here are a few pictures of his Saint-O-Lantern. I'll be back soon with pictures from our All Saints' Party. It was awesome! Most Sacred Heart of Jesus ~ Have mercy on us! wow, did he do it all by himself?! looks great! I did help him with some of the scraping... though he could have done it all on his own (like last year), we were just running out of time. Where do you get those patterns? Do you just trace something or enlarge something or what? My personal favorite! He did a great job! Jamie ~ Rascal usually prefers to find an image out of a coloring book, but Captain and I usually search the web for his image. I enlarge it on the computer till it is the size we want it -- and then print it out. We then decide what can get cut out and needs to be left or scraped. It is lots of fun! Their pumpkins were awesome! They all did a great job!